Crewe have signed defender James Tunnicliffe on loan for a month from League One side Wycombe Wanderers. Tunnicliffe, 23, has not played for Wycombe since the 6-0 home defeat by Huddersfield on 6 January. With manager Steve Davis short of defensive options, Tunnicliffe could make his debut against Crewe's local rivals Port Vale on Saturday. Captain David Artell and fellow centre-back Adam Dugdale are . Tunnicliffe began his career with Stockport County and had a trial at Liverpool before moving to Brighton in June 2009 for an undisclosed fee. After two years with the Seagulls, during which time he had loan spells at MK Dons and Bristol Rovers, Tunnicliffe signed a one-year deal at Wycombe following their promotion to League One. He has made 20 appearances for Gary Waddock's side, scoring one goal. 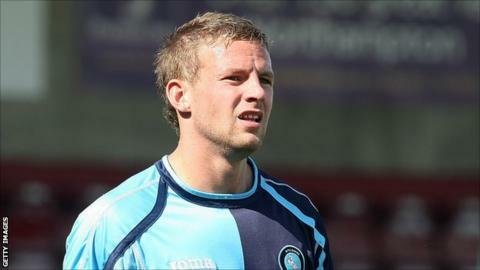 It is also believed that Crewe are hopeful of signing a former Championship left-back on a free transfer.